Once known as the "Playground of the Stars," Palm Springs retains much of the charm of the era when it was home to some of Hollywood's most glamorous film stars. Will You Like Palm Springs? Take a look at our Palm Springs Pictures. Palm Springs is popular with anyone who likes the desert or playing golf. It's also a center for mid-century modern (also known as 1950s) architecture and decor and a good place to shop at the furniture consignment stores. Palm Springs also has a large gay community and is popular with gay tourists. Palm Springs weather is best in the winter. Summers can be extraordinarily hot. While February may seem like the perfect time to go to Palm Springs, timing can be tricky. The Date Festival, Modernism Week and the Presidents Day long weekend, sometimes happen all at once, driving hotel prices toward the stratosphere. We can't find any data about how frequent this is overall, but during three out of three February visits to Palm Springs over the past dozen years, we've encountered high winds, which kicked up a sandstorm. A quick check of Youtube videos turns up at least one a year, most of them in January or February. When the Gal Pal visited in late February 2015, the weather was perfect, but it's worth checking the weather before you go, just to be sure you aren't caught in one. Lots of people like the Palm Springs Aerial Tram and your buddies may be astonished if you don't go. Find out more in the Aerial Tram guide. 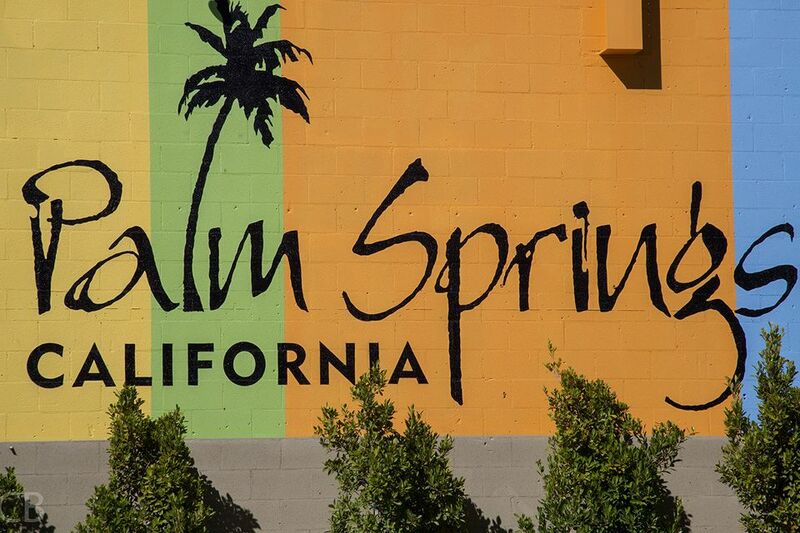 There's plenty more to keep you busy in the list of Top Things to Do in Palm Springs. If you use options other than our hotel guides to find a place to stay, be sure you research your choice carefully. Palm Springs has quite a few gay-only hotels and clothing-optional resorts, which may (or may not) be where you want to stay. Palm Springs is very busy in mid-winter. If you can go in early fall or late spring, you'll get better hotel prices, and the place will be less crowded. Make the most of Mid-Century Modern architecture with this guide to seeing some of the city's most gorgeous places. Palm Springs is a great place to go with your gal pals. After all, the top thing to do is "nothing" and the hotels have some great swimming pools to lounge around. Shop 'til You Drop: You can spend a lot of time browsing the shops along Palm Canyon Drive downtown, or for more upscale goods, Palm Desert's El Paseo brings Beverly Hills to the desert. The Cabazon Outlets also have lots of great places to browse around. Spa-a-a-h! Area hotels often offer Girls Getaway packages that include rooms and spa services. Dance the Night Away: Palm Springs has lots of dance clubs. At Zelda's, you can book a VIP table. Or try the Palm House, especially on Decades Night where you can get your groove on to the 80s and 90s music. Become your own Lady Luck: Agua Caliente Casino is in downtown Palm Springs, or you can both gamble and take in a show at the Morongo. A weekend getaway is a great time to enjoy a leisurely brunch. We like cheerful Cheeky's for brunch (or for breakfast anytime). The greater Palm Springs area includes a string of towns that stretch along CA Hwy 111, forming an almost continuous string of habitation. It can take more than half an hour to drive from one end to the other, which can be inconvenient if you choose a hotel at one end of town and all your planned activities are at the other. Some online reservation services will include all of them when you search for Palm Springs hotels, but at others, you may have to search by the individual town names. Roughly from north to south, they are: Palm Springs, Cathedral City, Palm Desert, Rancho Mirage, Thousand Palms, Indian Wells, Bermuda Dunes, La Quinta and Indio. Also nearby, across I-10 is Desert Hot Springs where you'll find a large number of hotels and hot springs spas. You'll need more than just a place to sleep while you're in Palm Springs. Take a look at things to do in Palm Springs for a weekend getaway. Palm Springs has all the big chain hotels, which are mostly what you'll find if you consult the typical hotel reservation websites. However, using those resources alone, you'd never find some of the lovely, smaller renovated hotels and motels that have much more character. To find out about these hidden gems, consult the hotel listings at TripAdvisor - you'll find they're often the highest-rated places around. While they all have websites, quite a few don't offer online reservations, instead asking you to email, fill out a form or call to find out if they have space available. A large percentage of local boutique hotels have only one bed per room. If you need more than that, be sure to confirm that the hotel has rooms that meet your needs. Some properties charge extra "resort fees" which are not always easy to find out about and can increase the total cost. Take extra care about this when using sources such as Priceline and Hotwire which don't give you the hotel name in advance. Whether or not you're looking for them, Palm Springs has a number of clothing optional lodgings and some that cater to gay clientele. Mid-Century Modern Lodging in Palm Springs. You'll find quite a few places to stay that have that great retro style. Use this guide to find the perfect mid-century Palm Springs hotel. Bed and breakfast inns can be harder to find without spending countless hours going through their websites. Bedandbreakfast.com gives you a handy place to check on many of them at once. Palm Springs is 140 miles from San Diego, 107 miles from Los Angeles. Use this guide to find out how to get from Los Angeles to Palm Springs.